Tom Kondas (right) with Ohio South Soccer president Ken Conselyea. 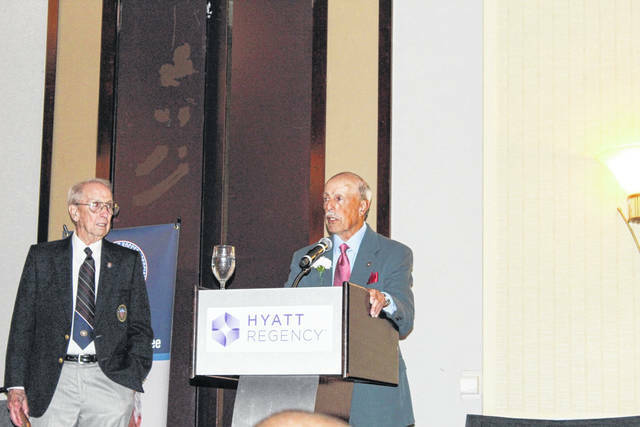 BUFFALO, N.Y. — Tom Kondas a longtime soccer player, administrator, and referee was recently inducted into the USASA Hall of Fame in Buffalo, New York. The 2018 U.S. Adult Soccer Hall of Fame class was inducted Saturday, September 22 at the Hyatt Regency Buffalo. Family and friends were present as this great class had their moment. After being stationed in Germany in the late 50s, Kondas brought his love for the game back to the area as a member of the German Club Edelweiss located on the banks of the Stillwater River in Englewood. From there, Kondas helped organize and was later president of the first soccer league in the region known as the Ohio-Indiana-Kentucky Soccer Association where he eventually convinced that and other regional leagues to play under the national league of the United States Soccer Federation (USSF). Then in 1971 in the basement of his home in Englewood, he began conducting the areas first official referee training and certification program under the USSF umbrella for both youth and high school leagues. Now at age 84, Kondas still works his farm and his horses on Westbrook Road in Brookville and is an active board member and coach for the German Club Edelweiss. Khondas recently made the trip to New York with his son Dr. Chris Kondas (who incidentally scored the game winning goals to give Northmont its first state championship in 1977) and his granddaughter Sydney. “It was an honor and a humbling experience to be recognized and get a chance to meet so many others who helped plant the seeds for a game that has become so popular today,” Kondas said.